Transcript: Welcome to MyBinding.com. These are the GBC PhotoPop SelfSeal Framed Photo Pouches, Birthday Theme. Welcome to MyBinding.com. These are the GBC PhotoPop SelfSeal Framed Photo Pouches, Birthday Theme. 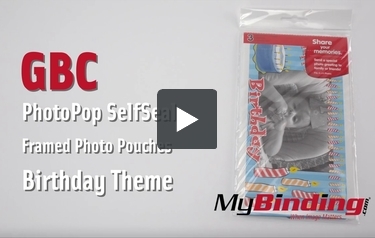 GBC's new PhotoPop photo pouches are a great way to show off your favorite pictures. Their durable, glossy plastic cover protects and borders your picture with a fun outline. This one has a cute birthday theme. Just open up the pouch, peel off the adhesive cover, align your photo and press the plastic cover down to seal it up. Then take the magnets and adhesive squares and adhere them to the corners, so it'll stick right on the fridge. Each pouch comes with its own envelope so you can mail one straight to grandma, you know she wants one.